U.S. equities rallied again on Friday, with the S&P 500 making its third straight weekly gain. Some positive China trade headlines as well as solid credit data are bolstering sentiment as we get solidly into the Q1 earnings season this week. 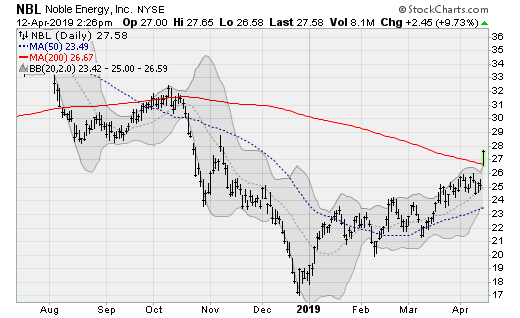 It’s the energy sector that I want to focus on today, with Chevron (NYSE:CVX) buying Anadarko (NYSE:APC) in a $33 billion deal, boosting APC shares up roughly 32%. I recommended buying the stock back on Monday, so that’s not a bad profit for just a four-day holding period. I think the entire sector is worth a look, with RBC analysts warning that $80-a-barrel oil is likely this summer as a result of steep OPEC supply cuts, solid demand and rising risks concerning Iran after President Donald Trump’s administration labeled part of its military establishment a terrorist organization. 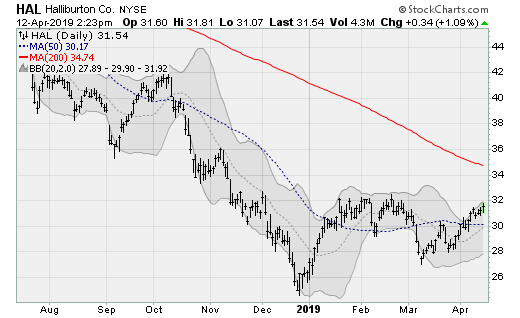 Halliburton (NYSE:HAL) shares are rising to challenge the highs of its five-month consolidation range, making a possible end to the downtrend that started last May that resulted in a 50% decline from its high. The company was recently initiated at Goldman Sachs with a buy rating. The company will next report results on April 22 before the bell. Analysts are looking for earnings of 23 cents per share on revenues of $5.5 billion. When the company last reported on Jan. 22, earnings of 41 cents per share beat estimates by four cents on a 0.1% decline in revenues. 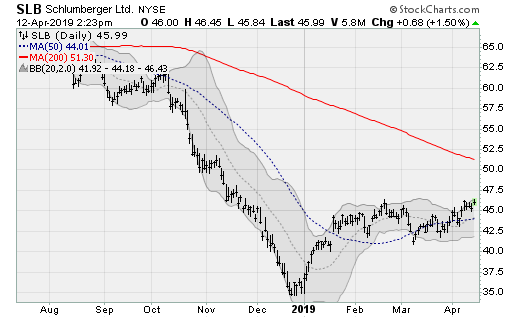 Shares of Schlumberger (NYSE:SLB), the oilfield service provider, are attempting to break up and out of a five-month consolidation pattern setting up a challenge of its 200-day moving average. Like HAL, the company had coverage initiated by Goldman Sachs analysts in March. The company will next report results on April 18 before the bell. Analysts are looking for earnings of 30 cents per share on revenues of $7.8 billion. When the company last reported on Jan. 18, earnings of 36 cents per share missed estimates by two cents on $8.1 billion in revenues. 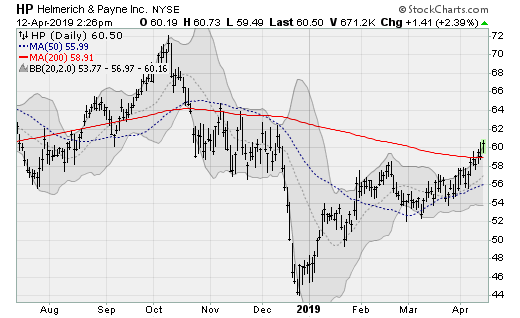 Shares of Helmerich & Payne (NYSE:HP) are breaking up and over their 200-day moving average for the first time since October. Shares lost more than 40% from the prior high. A return to those levels would be worth a 20% gain from here. Analysts at Jefferies downgraded shares back in March, ahead of the current rally to the upside. The company will next report results on April 24 after the close. Analysts are looking for earnings of 38 cents per share on revenues of $710.4 million. When the company last reported on Jan.29, earnings of 42 cents per share beat estimates by 12 cents on a 31.3% rise in revenues. 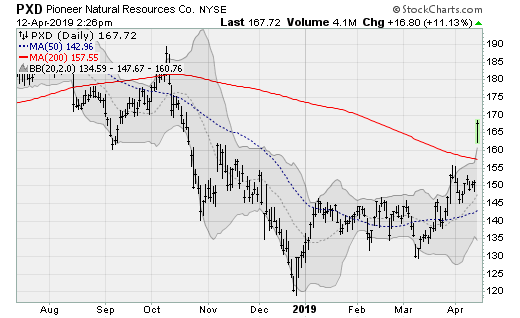 Shares of Pioneer Natural Resources (NYSE:PXD) surged more than 11% on Friday, cutting clear of their 200-day moving average and the six-month consolidation range. Watch for a return to the mid-October high, which would be worth a gain of roughly 12% from here. The company will next report results on May 6 after the close. Analysts are looking for earnings of $1.47 per share on revenues of $2.1 billion. When the company last reported on Feb. 13, earnings of $1.18 per share missed estimates by 16 cents on a 75.4% rise in revenues. Noble Energy (NYSE:NBL) stock is rising up and over its 200-day moving average, challenging its November high. The stock was upgraded by analysts at Mizuho back in March, with the price target raised to $29. Watch for a move to the October high, which would be worth a gain of nearly 20% from here. The company will next report results on May 3 before the bell. Analysts are looking for a loss of five cents per share on revenues of $1 billion. When the company last reported on Feb. 19, earnings of 12 cents per share missed estimates by two cents on a 0.3% drop in revenues. As of this writing, William Roth held no position in any of the aforementioned securities. 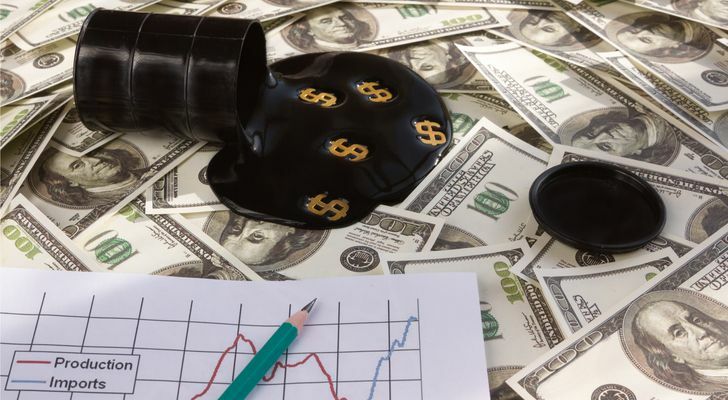 Article printed from InvestorPlace Media, https://investorplace.com/2019/04/5-energy-stocks-rising-as-crude-oil-soars/.